I’ve been doing a new practice warm-up that has been an excellent tool for growth and also jumpstarts my concentration and attention for the rest of my practice session. 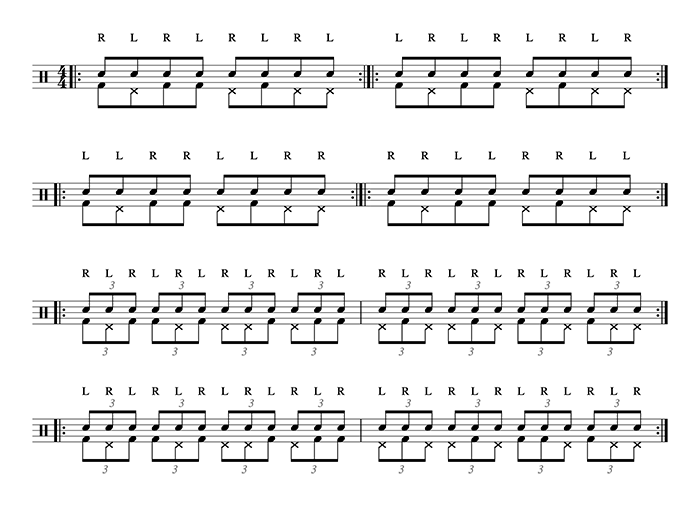 I keep it slow to encourage concentration and control, usually between 60-80 bpm. Once that’s comfortable, I keep the same pattern with the feet, but flip the hands. Next up is flipping the paradiddle I have going with the bass drum and hi-hat pedals. I try switching patterns every 4-8 measures. Remember, this is not about speed. It’s about control of your mind and body to set you up for a focused practice session. Once this gets easy (and it will with time), play doubles with the hands at the same eighth note rate. Bonus: Move from eighth notes to triplets for an added challenge.